Nov.,18th 2018 to April, 30th 2019, daily 10 a.m. to 4 p.m.
Dec., 24th until 12 p.m. , Closed: 25th, 26th , 31st Dec.
Jan., 1st 1 p.m. to 5 p.m.
Summer season May, 1st to Nov., 17th 2019, daily 9 a.m. to 18 p.m. Sat: 9 a.m. to 5 p.m., Sun: 12 a.m. to 5 p.m.
Sun, holidays: 9 a.m., 11a.m., 6 p.m. Sat: 6.30 a.m., 6 p.m.
Get tickets online right here or at the visitor reception/Sala terrena. Winter Season daily: 10 a.m.– 4 p.m.
Summer Season daily: 9 a.m.– 6 p.m.
Winter Season daily: 10 a.m.– 4 p.m. Summer Season daily: 9 a.m.– 6 p.m.
Winter Season Sat., Sun. and holidays: 2 p.m. – 4 p.m.
Summer Season Sat., Sun. and holidays: 2 p.m. – 5 p.m.
All prices per person include VAT. All ticket prices include 4 hours of free parking. Winter Season daily: 10:15 a.m./11:30 a.m./3:45 p.m.
Summer Season daily: 10 a.m./11:30 a.m./4:30 p.m.
Winter Season daily: 12:45 p.m.
Summer Season Mon.– Fri.: 1:30 p.m.| Sat.–Sun. : 1:30/3 p.m.
Winter Season daily: 2:30 p.m.
Summer Season Mon.– Fri.: 3:15 p.m.| Sat. –Sun. : 1 p.m./3:15 p.m.
**) Please note that during Divine Office, Mass and other liturgical ceremonies it is not always possible to visit/enter the monastery church. Barrier-free access via Stiftsplatz (attention: uneven ground due to cobblestones). Please note that the gardens and the museum in the Imperial Wing do not have barrier-free access. Available in 14 languages the audio guide offers an instructive and concise overview . The child-friendly infrastructure of the monastery guarantees a relaxed family outing. All themed tours and group packages can be scheduled daily at any time between 10 am and 5 pm. 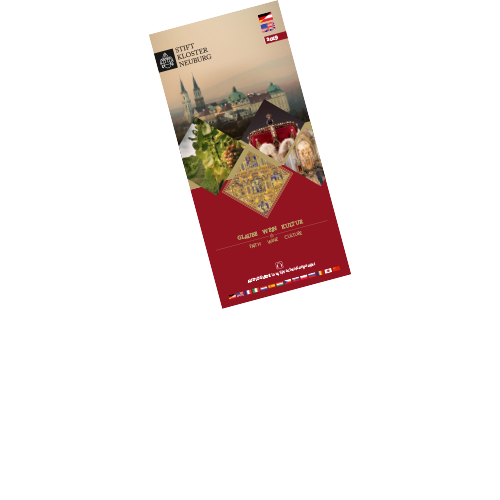 The accredited Austria Guide has the opportunity to adapt this 60-minute guided tour to guests’ interests, even at short notice, and to show them the art treasures in any order they choose. In the monastery shop at the visitor reception you'll find gifts and souvenirs 7 days a week. Free entrance with the Vienna Pass. Free Wi-Fi in the visitor area. In addition to our liturgical offers, the quality of the Monastery’s cultural and touristic services are very close to our hearts. following questions about your latest visit to the Monastery. To thank you for completing the questionnaire, all respondents aged 15 or older are invited to take part in a prize draw.